We’re not going to call the Arc’teryx Procline a ski boot because it’s so much more. Sure you can ski in them. But you can also do some serious climbing. That’s because the upper cuff splits into two sections while in walk mode, offering lateral ankle articulation previously impossible in a rigid ski boot. It might be better to call the Procline an alpinist boot, but that hides the fact that you can step into a tech binding and ski excitedly down sketchy terrain. 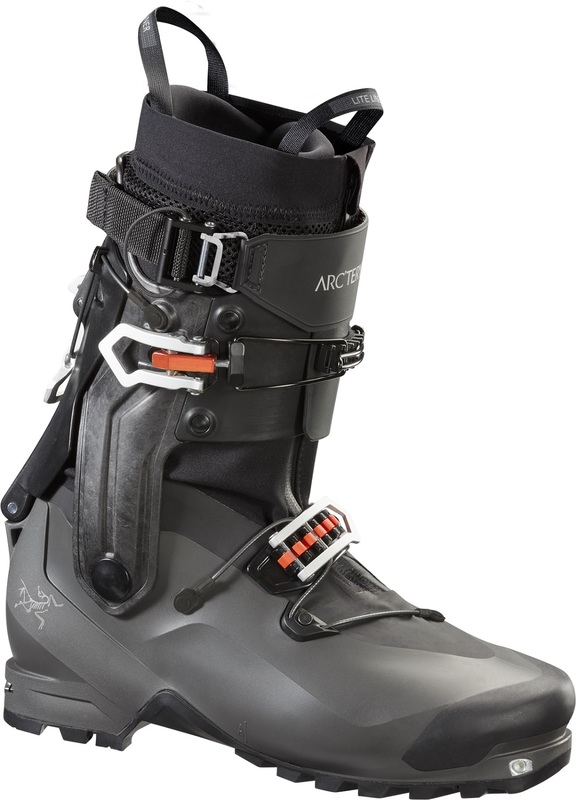 The Arc’teryx Procline could be the first true ski mountaineering boot, since equal design consideration was given to both skiing and mountaineering. Whatever you call it, we predict a lot of them will be seen in places previously no ski boot was found. 360° rotating cuff allows for natural ankle articulation not before seen in a ski boot. Integrated high-density CORDURA® gaiter is abrasion and puncture resistant. Grilamid and cuff has a split design that allows lateral articulation in walk mode. Elastic gaiter has a waterproof PVC coating and rugged zipper to keep your feet dry. Steel pivot point on the split cuff allows motion while still providing ankle support. Low-profile 6060 aluminum buckle is wired with a steel cable for a secure lower fit. Wide Cam Lock power strap provides dynamic flex with quick micro-adjustment. Special Vibram® tread pattern designed for edge control, braking, and smearing. Dynafit certified inserts make for reliable insert and release from tech bindings. Rubber toecap adds grip while climbing and endures some scrambling impacts. Reduced shell length, crampon-optimized toe, and rockered sole improve climbing. Two liner options help match your fit, weight, support, and warmth requirements. Support liner has a thin rubber sole for walking around basecamp. Bottom Line A true ski mountaineering boot. I hear these are a narrow-ish boot (98mm last?). Any idea how much these could be stretched, for those with wider forefoots? Hey Tyler! Yup, they're pretty narrow but the impressively low amount of volume is probably a bigger thing to worry about than the width as the liner is moldable and you can definitely punch the toe box. It's still a thin liner inside of a thin plastic shell, so while you can get room out of it, it's still pretty dang narrow with not a ton of extra space to spare. Where are they made? Canada or China? Hey Vadim! Sorry for the slow reply, we reached out to our rep to confirm one way or another where they are made. Turns out they are made in Romania! I bought into the hype and bought a pair of the non carbon ones. I have skied some mellow peaks, done a few miles of terrain, a little hiking with class 3 rock, and grade IV water ice in them. Impressions are good. They fit my wide bunionetted feet, articulate well and are generally comfortable. they climb ice fine, and ski well with plenty of control for my style. They are warm enough with the performance liners for mild Alaskan days. However, they are difficult to get on and off being unduly complicated. I would not want to deal with them in a cramped frozen tent in the morning. I also unfortunately discovered one painful spot on my left foot only when front pointing. Being right where the fabric gaiter glues to the shell it might be very difficult to punch. How would this boot compare in performance of touring and stiffness to my 2012 Scarpa F1? Hi Allan, I own the carbon Procline, and have skied this version of the Procline a fair bit. The touring performance is fantastic. The only boots that can get better are full on race boots. The ski performance is very good as the lateral flex of this boot is one of the stiffest that I've found. If you are a precise skier who can stay in balance, and drive from the ankles, you'll be very happy with this boot. The forward flex is on the softer side though. If you tend to use the forward flex of a boot as a crutch at times, you may not care for this boot as much. Due to the dual nature of the flex, it's hard to compare it to your F1. It took a slight adjustment for me, but after getting used to them they have been rewarding and enjoyable boots. Thanks for the input Nate. I think I'll be fine in these Procline's based on on your feedback. The F1 is not very stiff in fore flex and I'm a long time telemark skier with Scarpa TX Pro's ad F1's as I mentioned. I ski NTN Freerides as my dedicated area binding on one ski, Meidjo 2.0 NTN TeleTech, a DIY TTS and the Kreuzspitze Plate TeleAlp bindings so I'm comfortable driving skis from my ankles. I swap a Kreuzspitze SCTT heel around on Meidjo and Kreuz TeleAlp bindings to be able to lock em down when needed. I think I'm going to pick up some GT heels for a second Kreuz heel. I am wondering how much softer regular model is compared to the carbon fiber one. Or how it compares to the dynafit TLT 6 mountain that I ski right now. Hi David, the difference is noticeable but not significant. It is not as stiff as your TLT6 with the tongue in, best for balanced skiing with your ankles versus really driving off the front. Hi Jason, could you please provide the exact BSL of these boots for the sizes 26.0, 26.5, 27.0 and 27.5 ? Hi Fedor, we've received the boots and I was able to verify the BSLs for you. The 26.0/26.5 shell is 285mm and the 27s are 1cm longer. Hi skimo ...any news on delivery date for these boots? Hi Paul, we're expecting these by the middle of September. Fingers crossed!